It's time for Encore Magazine's Spring Restaurant Week and we couldn't be happier. We tried Press 102, a new restaurant in downtown Wilmington, that we loved before and had to come back to. Press 102's breakfast, lunch and dinner menus show some depth, but the time we went we ordered off the panini menu rather than the regular dinner menu. That time I had a Chicken and Waffle Panini. Fried chicken and fontina cheese between two Belgian-style waffles, served with stone-ground mustard and espresso-infused maple syrup. It was phenomenal, although with all the sugar and espresso, probably not the best thing to eat at 8:00 p.m.
On this trip to Press 102 we ordered off their restaurant week menu. 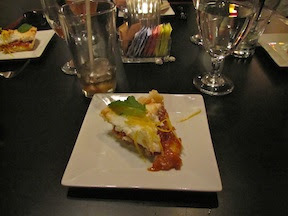 They had a prix fixe (fixed price), three-course offering that really showed the versatility of the folks in the kitchen. For $21 you had your choice of starter, main and dessert. 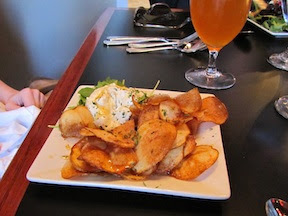 The house-made potato chips with blue cheese dip, one of the starters. 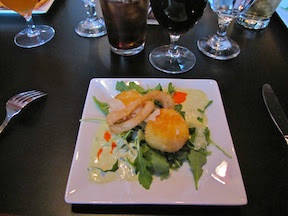 The starters were a spring salad, house-made potato chips with blue cheese dip, and shrimp-risotto fritters with jalapeno aioli. Between the four of us - me and Lauren, Howard and Laura - we had one of each and they all tasted pretty good. Shrimp-risotto fritters with jalapeno aioli. The aioli was great. The mains were a grilled applewood smoked pork chop with jalapeno pepper jam and cheddar mashed potatoes with crispy apples; roasted chicken piccatta with basil risotto, preserved lemon caper sauce and crispy spinach; or shrimp carbonara with buccatini pasta, applewood smoked bacon and English peas in a light cream sauce. Lauren's Chicken Piccatta. 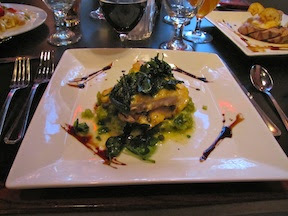 It was tasty, though the risotto was a little salty. Laura's pork chop. Flavorful, but a little tough (but it was a chop, not a tenderloin). 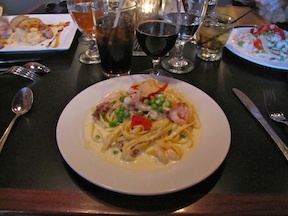 Howard and I had the shrimp carbonara with bacon (mmm) and English peas. It was awesome. For dessert there was some sort of lemon sorbet with mango-basil relish, a rustic peach custard pie and a house-made strawberry shortcake. Now, I don't know why the strawberry shortcake had to specify it was "house-made," I hoped all the desserts were made in-house. Either way, none of us got the lemon sorbet. Laura, Lauren and I had the rustic peach custard pie. It came with merengue on top, that's not very rustic to me. Now a top pie crust as delicious as the bottom crust? That would have been rustic. 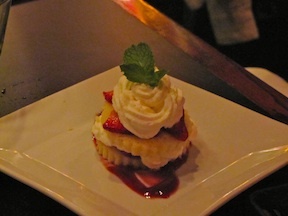 Howard had the strawberry shortcake. Despite it being early for strawberries, he said it was good. 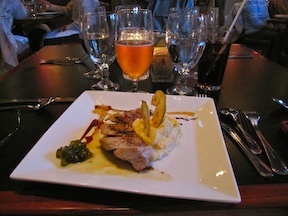 The bottom line is this: Restaurant Week = Awesome. It's a great chance to try new places and new dishes. We'll be going back to Press 102, and this time I'm coming home with a picture of that chicken and waffle panini.